11 Commercial Real Estate & Properties in Tingalpa are listed in 4 categories. 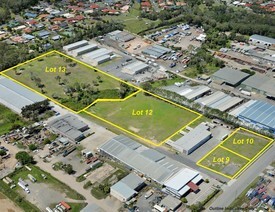 We have 9 Industrial Warehouses Sale , 4 OfficesSale , 4 Development LandsSale and 2 Retail ShopsSale . Adjacent 69sqm 77sqm units in the front centre of The Annex development Warehouse/ ground floor display space plus a/c, carpeted mezzanines rated to 5kPa Three Exclusive car parks on title plus visitor parking in the complex Both units have front side windows providing great natural light Amenities include kitchenettes disabled size bathrooms Secure, quality concrete tilt panel construction, removable bollards in front of each roller door, cable gated site with 24 hour CCTV monitoring to your device Ideally located just 2.5km from the Gateway Motorway Available to purchase individually or combined 12 MONTH RENTAL GUARANTEE OFFERED FOR INVESTOR PURCHASERS REFLECTING 7.5% NET RETURN Individually Priced at Unit 13: $269,000 + GST Unit 14: $275,000 + GST Combined Purchase Price: $530,000 (GST Exempt with 12mth lease back to developer) ( approx.) Please contact the Exclusive Agents Jared Doyle or Jack Gwyn of Ray White Commercial TradeCoast. Construction is almost completed at The Annex development and is due for completion in February 2018 91sqm office/warehouse 66sqm warehouse/ ground floor foot print 25sqm a/c mezzanine Electric container height roller door All units are individually metered and come standard with sealed concrete floors, open mezzanine level with air conditioning, kitchenette bathroom amenities and in unit hose facilities. Solid and Secure, quality full height concrete tilt panel construction, gated site with 24 hour CCTV monitoring to your device. Ideally located circa 2.5km from the Gateway Motorway linking you to Brisbane's major arterial networks close proximity to Bayside suburbs Plans, pricing, upgrades Expression of Interest form available on request Lease Price: $24,800 p/a + Outgoings + GST ( approx.) Images indicative only For a detailed Information Memorandum or to arrange an inspection please contact the Exclusive Marketing Agents Jared Doyle or Jack Gwyn of Ray White Commercial TradeCoast today! 370sqm functional modern tilt panel Tingalpa office/ warehouse 244sqm fully cabled office space over two levels fitted out with a reception/ showroom, partitioned offices, board room, dedicated server room and an open plan area 126sqm clear span warehouse with epoxy floor coating 3 phase power Fantastic insulation/ ventilation Electric container height roller door with an awning Five (5 ) under cover car spaces plus street parking available Alarm system Male and female toilets and kitchenette Great value! Sale Price: $750,000 + GST ( approx.) For further information or to arrange an inspection please contact the Exclusive Marketing Agents Jack Gwyn or Jared Doyle of Ray White Commercial TradeCoast! Tingalpa is located approximately 11 radial kilometres east of the Brisbane CBD and remains one of the most sought after suburbs within the Tradecoast precinct. The subject site borders the suburbs of Belmont, Cannon Hill, Hemmant, Wakerley and Manly West. This site benefits from its excellent proximity and easy connectivity to major arterial road networks providing easy access to the Port of Brisbane, Brisbane Airport and all destinations north south. + Lot 9 2,000sqm + Lot 10 2,001sqm + Lot 12 12,560sqm + Lot 13 21,760sqm + All lots DA approved building sizes from 930sqm to 12,658sqm + Approximately 11.5klms from Brisbane CBD + Close proximity to the Gateway Motorway + Great opportunities for owner occupiers, investors developers + Information Memorandum and plans available on request ( approx.) For further information please contact Exclusive Marketing Agents CBRE or Ray White Commercial Trade Coast. Price Reduced - Last Remaining Gi Land In The Trade Coast For sale via offers to pu..
CBRE is proud to present for sale by way of Offers to Purchase, one of the last remaining industrial sub division opportunities within a highly sought after suburb of Tingalpa. There are 10 lots on offer with land available from 2,000sqm 10,000sqm. This land sub division is located approximately 12 radial kilometres east of Brisbane's CBD in the industrial precinct of Tingalpa. The subject site is within close proximity to the gateway arterial, the Port of Brisbane and the Brisbane Airport. 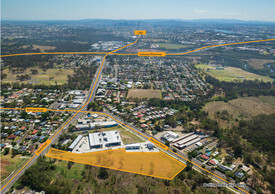 New Cleveland Road is accessed off main Manly Road and boasts surrounding tenants such as Bunnings, Masters & McDonalds. Lot 10 2,000 sqm Lot 11 SOLD Lot 12 SOLD Lot 13 SOLD Lot 14 2,060 sqm Lot 15 1,832 sqm Lot 16 2,000 sqm Lot 17 2,000 sqm UNDER OFFER Lot 18 2,000 sqm UNDER OFFER Lot 19 SOLD Please contact Exclusive Agents Ben Lyons or Nick Witheriff of CBRE or David Gibson of Colliers for a copy of the Information Memorandum and to secure your block today! Description: 491m2 impeccably finished warehouse Front road exposure Air conditioned and reception area in the entrance Adjacent to Masters and rear Bunnings warehouse Situated close to Murarrie Gateway Corridor with easy access to part of Brisbane Contact Nicole Plath 0410 328 319 for an inspection or further details Area: Office: 123m² Warehouse: 368m² Total: 491m2 Location: Located approximately 18kms from the Brisbane CBD within the Australia Trade Coast precinct. The arterial network servicing this area is the Gateway Arterial road which provides access to both the north and south coast regions as well and the Logan Motorway to the south which provides some major links to the west. This area has become the home to some of Australia's largest companies for their Brisbane facilities and is well located to both CBD and the major arterial networks throughout greater Brisbane.